Late Saturday night, NASA's Mars Science Laboratory spacecraft successfully fine-tuned its course to better zero in on its target entry point into the Martian atmosphere on landing day. Two brief thruster firings totaling about six seconds altered the spacecraft's velocity slightly, by about one-fortieth of one mile per hour (one centimeter per second). This trajectory correction maneuver the fourth since MSL's launch adjusted the point at which Curiosity will enter the Martian atmosphere by about 13 miles (21 kilometers). On landing day, MSL can steer enough during its flight through the upper atmosphere to correct for a miss of the target entry point by a few miles and still land within its target ellipse. Mission engineers and managers rated the projected 13-mile miss big enough to warrant a correction maneuver. Telemetry and tracking data indicate the maneuver was successful. MSL will have two further opportunities for additional course corrections during the final 48 hours before landing, if needed. Tonight the Mars Science Laboratory spacecraft is scheduled to perform a very small course adjustment, called Trajectory Correction Maneuver 4 (TCM-4). Around 10 p.m. PDT (1 a.m. EDT), two brief thruster firings totaling about six seconds will adjust the spacecraft's trajectory to better home in on Curiosity's target entry point into the Martian atmosphere. This course adjustment will be the fourth performed during MSL's journey between Earth and Mars. The maneuver will turn the spacecraft to its final attitude and mark the start of Curiosity's final approach to the Red Planet. The flight team continues to monitor the Mars Science Laboratory spacecraft's telemetry and track its trajectory. There are no real-time spacecraft activities planned today. Late tomorrow night, the spacecraft is scheduled to perform its fourth and smallest trajectory correction maneuver, which will mark the beginning of MSL's final approach to Mars. With completion of nearly all work to configure the Mars Science Laboratory spacecraft for entry, descent and landing, most of the flight team is getting some well-deserved rest today in preparation for next week's final approach to Mars. There are no planned flight team spacecraft activities today. NASA's Deep Space Network continues to monitor spacecraft telemetry and track the spacecraft's trajectory. Today, the Mars Science Laboratory's terminal descent sensor is being checked out in preparation for Curiosity’s entry, descent and landing. The sensor is a radar system that is mounted on MSL's descent stage. Following separation of MSL's heat shield at an altitude of approximately 5 miles (8 kilometers) and a velocity of approximately 280 mph (125 meters per second), the sensor begins collecting data on the spacecraft's velocity and altitude in preparation for landing. Today, Curiosity's two lithium ion rechargeable batteries are being recharged to 100 percent of capacity in preparation for entry, descent and landing. The batteries, which have been maintained at a 70-percent state of charge during the cruise to Mars, are being recharged using power from Mars Science Laboratory's cruise-stage solar array. The batteries enable Curiosity's power subsystem to meet peak power demands of rover activities when the demand temporarily exceeds the onboard multi-mission radioisotope thermoelectric generator (MMRTG) steady output level. With a capacity of about 42 amp-hours each, the batteries are expected to go through multiple charge-discharge cycles per Martian day. 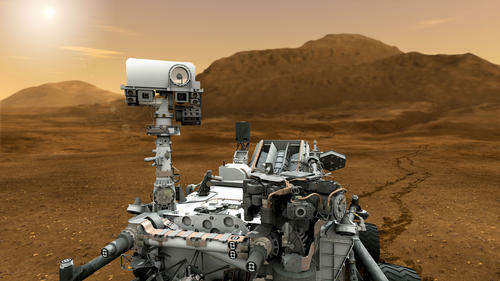 Preparations continue for Curiosity's entry, descent and landing and surface operations. Today, the two inertial measurement units (IMUs) in Mars Science Laboratory's descent stage are being configured, along with other guidance and control parameters for entry, descent and landing. The IMUs are electronic devices that will be used to maneuver the spacecraft's descent stage, measuring and reporting on its velocity, orientation and gravitational forces. The descent stage does its main work during the final few minutes before touchdown on Mars, providing rocket-powered deceleration and two bands of telecommunications for the final phase of MSL's arrival at Mars that includes lowering the Curiosity rover on a bridle and continuing descent until rover touchdown. In addition, more communications parameter updates for Curiosity's surface operations are being uploaded to Curiosity's main computers. Engineers at NASA's Deep Space Network continue to run differential ranging track passes to track Mars Science Laboratory's trajectory. These activities are designed to more closely track the spacecraft's trajectory and position as it draws nearer to the Red Planet and Mars' gravitational influence on the spacecraft increases. Today, engineers at NASA's Deep Space Network are running two differential ranging track passes to track Mars Science Laboratory's trajectory. These activities are designed to more closely track the spacecraft's trajectory and position as it draws nearer to the Red Planet and Mars' gravitational influence on the spacecraft increases. As of yesterday evening, the week-long reboot and configuration activities on Curiosity's two redundant main computers, or Rover Compute Elements -- including the uplink of spacecraft configuration parameters for entry, descent and landing -- were completed, a day ahead of schedule. Today, backup software for Curiosity's entry, descent and landing is being configured onboard the Mars Science Laboratory spacecraft. In case Curiosity's prime computer resets for any reason during the critical minutes of entry, descent and landing, this backup software is designed to enable Curiosity's backup computer to promptly take control and finish the landing with a bare-bones version of entry, descent and landing instructions. With updated flight sequences and communications parameters for entry, descent and landing and surface operations now uploaded to one of Curiosity's two redundant main computers -- Rover Compute Element (RCE)-B -- today RCE-A is being swapped back to become Curiosity's prime computer, and RCE-B is returning to backup mode. Prime computer RCE-A will then receive its own set of updated flight sequences and communications parameters. Activities continue to prepare Curiosity's redundant main computers, or Rover Compute Elements, for arrival at Mars. Today, Curiosity's RCE-A computer, which was swapped with the backup computer yesterday, is being cold reset, or rebooted, while in online, or backup, mode. Work continues to upload updated flight sequences and communications parameters for Curiosity's entry, descent and landing and surface operations to the spacecraft. In addition, mission controllers yesterday completed the 21st attitude control turn on the Mars Science Laboratory spacecraft, a day early. This turn adjusts the spacecraft's orientation to keep its medium-gain antenna pointed toward Earth for communications. This was the second-to-last attitude control turn planned before landing day. Activities continue through July 20 to prepare Curiosity’s redundant main computers, or Rover Compute Elements, for arrival at Mars. Today, the computer that has been operating as Curiosity’s prime computer is being swapped with the backup computer. On Wednesday July 18, that computer will be cold reset, or rebooted, while in online, or backup mode, following the same process used to cold reset the redundant computer on July 16. In addition, beginning today and continuing through July 20, updated flight sequences and communications parameters for Curiosity’s entry, descent and landing and surface operations will be uploaded to the spacecraft. Beginning today, Curiosity's redundant main computers, or Rover Compute Elements, will be power-cycled while in the online, or backup mode. The process, called a cold reset, reboots the computer, resetting it to a predictable, default state prior to the mission's arrival at Mars. This activity begins today with the reboot of the backup computer while in the online state and will continue through July 20. Tomorrow, the prime and backup computers will be swapped, and the reboot process will be repeated on Thursday with the other computer. The Radiation Assessment Detector instrument on Curiosity has finished the measurements it had been making during its flight from Earth to Mars. It will be configured for surface operations and turned off today and remain turned off until after landing. Today, the Mars Science Laboratory flight team is conducting a final operations readiness test of entry, descent and landing procedures in preparation for Curiosity's landing on Aug. 5, PDT. The Mars Science Laboratory Spacecraft completed an attitude control turn today, adjusting its orientation for keeping its medium-gain antenna pointed toward Earth for communications. This was the third-to-last attitude control turn planned before landing day.